After Albertville, take the road to Moutiers (26 km) then take exit 40, towards Belleville valley. TGV train station of Moutiers, then take a bus to Saint Marcel. In Saint Marcel, after leaving the restaurant La Bouitte on your left, take the second street on the right. Laura is the chalet on top of this lane. Les Menuires Guarantees Snow Satisfaction ! Les Menuires and Saint Martin de Belleville are guaranteeing snow satisifaction to skiers this winter or their money back on lift passes and accommodation. 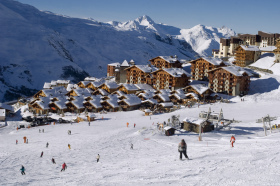 The two resorts benefit from exceptional snowcover since their pistes reach 2850 metres in altitude. Les Menuires tourist office is so confident in its excellent snow record, this will be the fourth season that they have offered to reimburse skiers. This "Neige Garantie" contract covers 63 pistes. The Les Menuires/Saint Martin ski area counts a total of 76 pistes. The 13 runs excluded from the contract are either reserved for specific practices or are considered secondary pistes and thus are not included in the snowcover guarantee. Each day that the resort is open - from Dec. 18, 2010 to April 16, 2011 - the official number of open pistes will be posted on the resort's Web site. If less than 80 percent of the 63 pistes are open because of a lack of snow, the client may choose to leave the resort and ask for his or her money back. The unused days of the skipass and those of the accommodation will be reimbursed. It is necessary to book either accommodation only or an all-inclusive stay through Menuires Réservation, to take advantage of this offer,. Make sure the hotel or residence displays the "Neige Garantie" logo. It is also possible to reserve directly with the hotel or residence and to still be covered by the "Neige Garantie" contract. Lift passes purchased through Les Menuires' online sales site are also covered by the contract. Participating hotels and residences are listed in the Menuires/Saint Martin de Belleville brochure and on the resort's Web site. Look for the "Neige Garantie" logo.